What better place to see an airplane weathervane than silhouetted against the skyline? 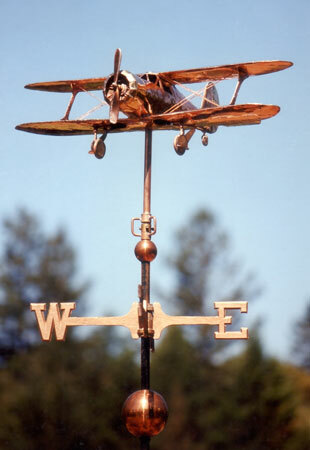 The Beechcraft Staggerwing Airplane Weather Vane has a readily identifiable profile, the two wings giving it a dramatic appearance when viewed from the ground. As with all our weather vanes the Staggerwing can be made entirely out of copper, with optional brass and/or nickel silver. The price includes a gold leaf N number, if so desired. Optional gold leaf and/or palladium leaf can also be added to match individual markings, if desired. If you have questions about this or would like us to prepare a quote, we would be happy to do so. You can also choose to have your Staggerwing weather vane shown with the landing gear up or down. We are often able to reduce the design fee for our more mechanical weathervane commissions if detailed schematic drawings are available. Also helpful are photos of the actual aircraft we will be representing. If customers can provide us with detailed photos from all angles of the insignia, detailing, interiors, etc., we are then able to make personalized enhancements to their weathervane. Often overlooked when sending photos is detail of the underside of the aircraft. This is an important view when looking up at a weathervane. If actual scaled down models are available, we often find them helpful guides during the construction process. All of our airplane weathervanes and our soaring bird weather vanes come with a standard security device. This is important because in high winds the sculpture piece itself can develop lift under the wings causing it to shimmy up the vertical installation rod! The security device allows the weather vane to turn freely in the wind but prevents it from lifting up when winds are high. The Beechcraft Model 17 Staggerwing is an American biplane with an atypical negative stagger (the lower wing is further forward than the upper wing), that first flew in 1932. The Model 17’s unusual negative stagger wing configuration and unique shape maximized pilot visibility. Construction was complex and took many man-hours to complete. The Staggerwing’s retractable conventional landing gear (uncommon at that time), when combined with its careful streamlining, lightweight, and powerful radial engine made for a very well performing craft. During its heyday it was used as an executive aircraft, much as the private jet is now.